Microsoft Excel is the most used project management tool, though there are specialist applications available such as Microsoft Project. Ability to adapt: It’s easy to add more features to an Excel workbook and customize it to suit our unique project management needs. Easy to Share: It’s easy to share the files with team members as Excel is installed in computers in almost every company. The Excel templates from indzara.com are built with the principles of simplicity and effectiveness. They are designed to be easy to use but they don’t lack in functionality. Here is just a couple of examples. Our Project Planner and Project Manager templates use Automatic Scheduling where tasks are automatically scheduled in our project plan. (What is Automatic Scheduling in Project Management?). Our Calendar Maker and Task Manager templates can handle recurring (monthly, weekly, 4th Friday of a month, etc.) events and tasks and automatically create those events/tasks for us. These tools help us save time, save money and be more organized & efficient. The following is the list of Excel Templates currently available. More are being added regularly. You can use the links to visit the individual template pages and learn more about them. Each template has video demos (YouTube Channel) and detailed documentation. I have also provided a brief overview of each of them further down below in this page. If you don’t find a specific template, please contact me with specific requirements or leave a comment in the comment section below. I will add to my product road map to publish. To know if and when projects will complete given each project’s tasks, task duration, resource availability and project priority. If you have any due dates for projects, the template can determine if project will complete by due date. To determine how many hours of work are still pending after the planning period is over, so that you can request more resources. To prepare printable project schedule (Gantt chart) and resource schedule. 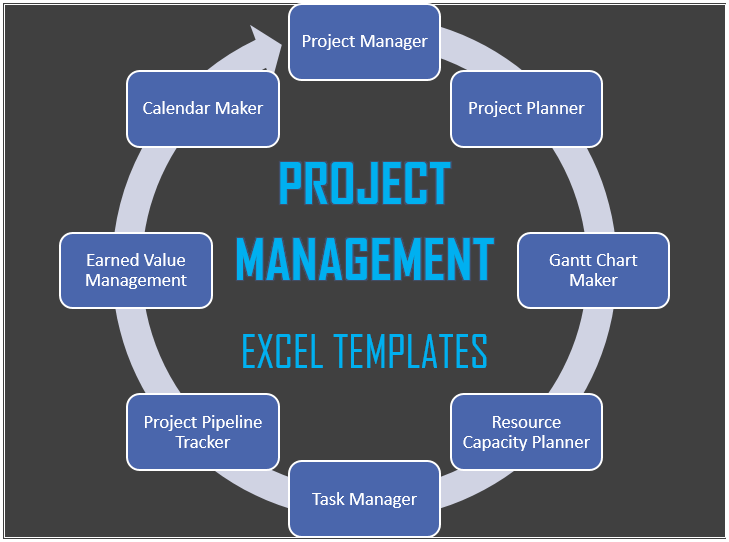 A collection of all 6 premium Excel templates is available as a bundle in Project Management Toolkit. 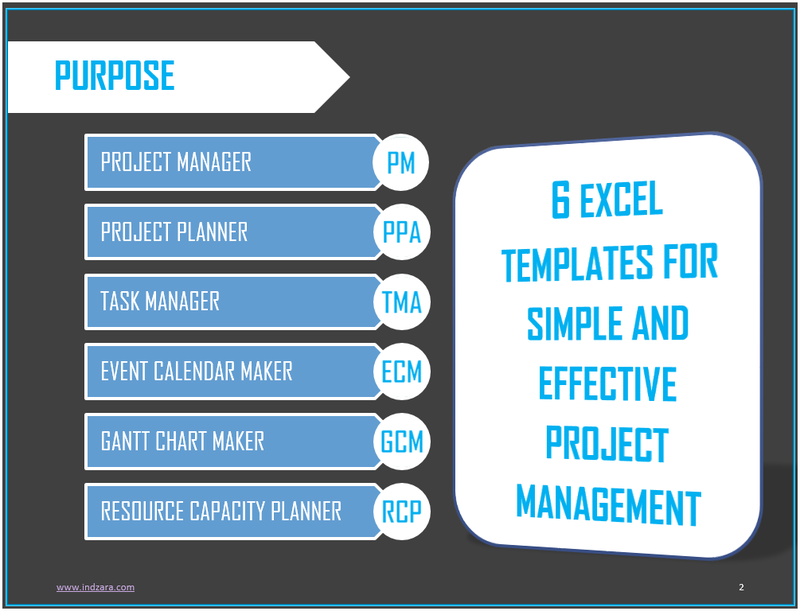 The purpose of the template is to plan and manage a project effectively and efficiently from start to finish. The template takes as input the scope of work and builds out the schedule. It incorporates cost management and resource management all into one solution. Read about Project Management Framework. Plan your projects quickly with the Project Planner (Advanced) template. Each task can have up to two predecessors (dependencies). A task can begin only the day after its predecessors have completed. Customize with company holidays and company weekends, Personal leave. This Excel template is designed to help create and update status of tasks easily. This can be used by project managers who handle multiple tasks and manage multiple team members. This can also be used by individuals to manage personal tasks. Gantt chart is the most common method used to visualize project schedule. The Gantt Chart Maker Excel template allows one to easily create Gantt charts instantly. Visualization: Assign each task a color. Assign each resource a color. 10 colors. The Event Calendar Maker is an Excel template (.xlsx) that you can use to create your own personalized event calendars instantly. This is a great tool to build project calendars highlighting milestones in your projects. This Excel template is helpful in understanding the available resource capacity, comparing with demand and identifying surplus/deficit capacity by skill groups. The template takes the resource availability, holidays, weekends, overtime and vacation data to calculate capacity. Then, based on your input demand data, it can calculate the surplus/deficit capacity by Skill and Project. These templates are probably the most useful things on the entire internet… you guys rock! Thank you! Outstanding array of templates for a project manager. Thank you for the feedback. You have a very nice collection of project management templates as well.